What do you feed your poultry and pigs? Chickens and pigs can forage on pasture for a great deal of their food, but do require supplemental feed to meet their nutritional requirements. A rule of thumb is that they can get about 10-30% of their nutrition from forage. You might ask, how do they survive in the wild? Part of the answer to that is that they are not confined and can move to "richer ground" seasonally and as they need to. But in a normal homestead situation, poultry and pigs will need supplemental feed. You can reduce the amount of store-bought feed by growing some feed sources and creative scrounging from local farms. Growing grains seems obvious, but consider growing crops such as turnips, mangel beets, winter squash, pumpkins, carrots, and sweet potatoes, too. Dairy products are a good supplement for both pigs and poultry, and dairies or small producers might let you have some of their un-salable product. Other sources include spent grains from a local brewery, or vegetable waste from local canneries. A member in SC asks neighbors if he can rake acorns in their woods and comes home with his truck bed full. Another farmer has a deal with a couple farms who raise sweet potatoes to turn his pigs into their fields after the harvest. They glean the remaining roots and eat the plants. The same can be done in orchards after the harvest, this works great for both pigs and poultry. And what about raising earthworms to feed your pigs and poultry, or sources for meat scraps? Poultry and pigs are omnivores, and will appreciate these high protein feeds. Mangel Beets. Photo from Seed Savers Exchange. Many heritage breeds are active foragers, especially if they have been selected to do well on pasture. 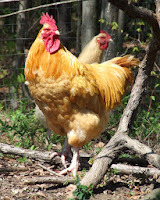 Among the chicken breeds, some are more active than others. The Mediterranean breeds are typically good foragers with high egg production but are lightweight birds (though I've eaten many a Leghorn cockerel). Among the dual purpose birds, most are good foragers, such as Dorking, Java, Buckeye, Dominique, Holland, Chantecler, & Crevecoeur. Waterfowl are good grazers too, and some ducks rival chickens in egg production. What creative sources have you found to feed your pigs and poultry? have you found any good books or websites that compare different feeds? The most commonly asked question about heritage breeds is, “Where do I find them?” Heritage breeds can be hard to find, especially finding the breed you want near you. That’s the thing about endangered breeds – they are rare! 1. The Livestock Conservancy’s online Breeders Directory. Livestock Conservancy members are some of the most passionate about conserving their breeds, so they may be aligned with your breeding objectives. 2. The Livestock Conservancy’s online Classifieds. 3. Breed Associations. Finding a breeder through the Breed Association is a great way to find knowledgeable and dedicated breeders. And if you’re just starting out, this is also a great place to find a mentor. 4. Networking with local farmers. Raising the same heritage breeds as others in your area can create a strong community of breeders, raising the effective “herd” size in the region. Some breeder groups have even banded together to leverage volume buying discounts or co-marketing to larger customers. Start asking around to find out who is raising heritage breeds in your area. 5. Heritage poultry. Many serious poultry breeders are members of the Society for Preservation of Poultry Antiquities (SPPA). 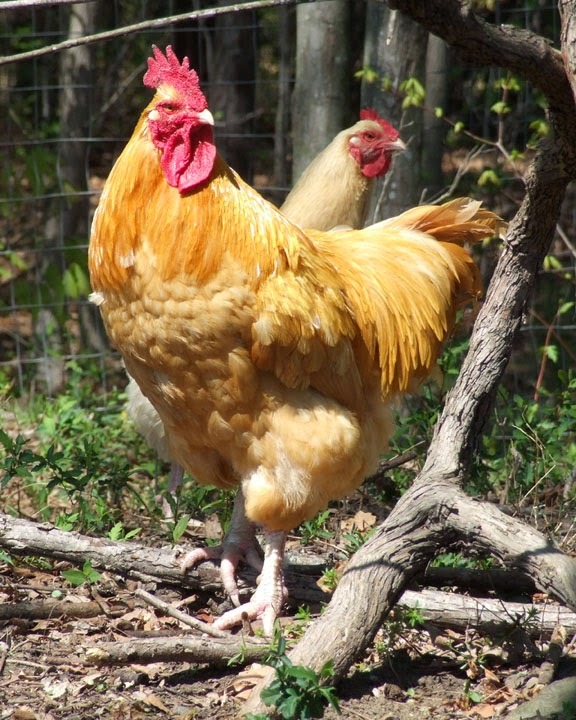 Their breeders directory is a great place to find unusual and rare breeds of poultry. What makes a Colonial Spanish horse? In October we spent a few days in Oklahoma checking in on some Choctaw horses, and progress toward our new Choctaw hog project. 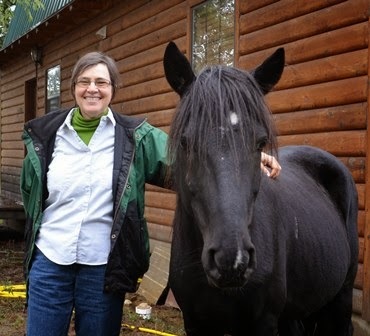 The horses greeted us at the cabin door of our gracious host Jim Stephens. On a roadtrip to nearby ridgelands, Bryant Rickman, who is a walking encyclopedia of knowledge of Choctaw horses, introduced us to several free ranging bands. Jeannette got more great pictures, despite steady rain. Choctaw horses are both culturally and genetically significant (see Looking Back and Looking Forward With Choctaw Horses, Winter 2013 Livestock Conservancy Newsletter). This brief visit gave me another opportunity to "train my eye" on horses, an important job skill for telling breeds apart, and most especially, telling the influence of cross breeding. With a landrace breed like Colonial Spanish horses, the breed standard is "descriptive" rather than "prescriptive", and the variation between the different strains of Colonial Spanish horses is important to being adapted to the local region. Nevertheless, all the strains have a number of characteristics in common that make them distinctly Spanish in origin. Below is a partial reprint of the Colonial Spanish Horse Score Sheet (or breed standard, if you like). The entire sheet can be found in "Managing Breeds For a Secure Future", by Drs. Phil Sponenberg and Don Bixby, or write the Conservancy to obtain a copy. Colonial Spanish Horse score sheet developed by D. P. Sponenberg and Chuck Reed. Horses are scored on various aspects of conformation and type. The final result is not a simple average of scores, but rather a close look at the number of not typical (high) versus typical (low) scores. The head character weighs in heavily in the final determination, especially if the body scores well. Put another way, a high-scoring body with a low-scoring head is still rejected because these horses are unlikely to be Colonial Spanish. NOTE: This is a partial reprint, showing only the characteristics for the head. 1. dished as in Arabian. Wide between eyes (cranial portion) but tapering and “chiseled” in nasal/facial portion. This is a very important indicator, and width between eyes with sculpted taper to fine muzzle is very typical. Wide and fleshy throughout head from cranial portion to muzzle. Small, thin, and crescent-shaped. Flare larger when excited or exerting. Large, round, and open at rest. Long, straight, with no inward point at tip. Thick, wide, or boxy. Large and bold, low on head. coarse and thick with lower lip loose, large, and projecting beyond upper lip. Fine taper down face to nostrils, slight outward flare, and then inward delicate curve to small, fine muzzle that is narrower than region between nostrils. Coarse and rounded, or heavy and somewhat square as the Quarter Horses, rather than having the tapering curves of the typical muzzle. Other characteristics on the complete score sheet include appearance of the neck, height, withers, back, croup, tail set, shoulder, chest, chestnuts, color, hind legs, rear, hip, front cannon bones, and overall muscling. Train your own eye by looking at these characteristics for animals you know to be of different breeds. It works for other species too. If you raise goats, pigs, sheep or cattle, what are the characteristics that distinguish your breed from other breeds? How well trained is your eye? Happy Thanksgiving everyone! If you're thinking of raising turkeys next year, now is the time to check with breeders and reserve hatching eggs or poults. There are a variety of colors to choose from, so you can go traditional or play with the Crayola box. Check out The Livestock Conservancy's online breeders directory and classifieds, or join the Conservancy for a complete print version of the Breeders Directory (products too!). Here's a piece on domestic turkey origins. getting rid of unwanted bugs in the yard. The ancestor of the domestic turkey is the North American wild turkey. Like other domestic livestock, wild turkeys were suited for domestication by their tolerance for living in close proximity with humans, flexible diet, and long reproductive season. Wild turkeys from Mexico (Meleagris gallopavo subspecies gallopavo) were domesticated by the precontact native cultures before 180AD. These turkeys were transported in the 1500’s to Europe and several varieties were developed. European varieties returned to North America in the 17th and 18th centuries with settlers, and from them our current domestic varieties were developed. The Mexican progenitor of the domestic turkey and many of the early European varieties are extinct. Turkeys were common on farms in colonial America for domestic use and were transported by ship to many markets. On early farmsteads some breeders crossed domestic turkeys with wild turkeys, probably the Eastern Wild Turkey (Meleagris gallopavo silvestris). Recent DNA studies, however, show minimal contribution of wild turkeys to the domestic turkey genome, so the hybrids were probably crossed back to the domestic varieties for improved temperament and productivity. Specialized varieties of turkeys were developed by selecting for local adaptation, color, growth, and temperament, and these varieties were named for the region where they were developed and their color. Eight varieties of American turkeys are recognized by the American Poultry Association (APA), Black, Bourbon Red, Standard Bronze, Narragansett, Royal Palm, Slate, White Holland, and Beltsville Small White. Two additional varieties developed in the mid to late 20th century are now used widely in commercial production, the Broad Breasted White and the Broad Breasted Bronze. Of the eight APA recognized varieties, five were well established by the 1870s when standards were created – these are the Black, Bronze, Narragansett, Slate, and White Holland. Documented history indicates that these varieties likely originated in the 1700’s. 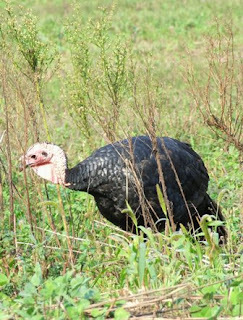 The domestic turkey is a single breed with the different varieties defined primarily by plumage color and conformation. DNA studies comparing 5 heritage varieties (Narragansett, Black, Bourbon Red, Royal Palm, and Slate) found them to be very closely related to each other and to the more populous broad breasted white (commercial turkey), consistent with their documented history and their treatment as a single breed. Heritage turkey numbers declined rapidly after development of the Broad Breasted White. A census by The Livestock Conservancy in 1997 found only 1330 breeding birds of all varieties combined. Through promotion efforts and growing interest in locally produced food, these numbers have increased and most varieties are out of immediate danger of extinction. Additional growth in breeding populations are needed, however, to ensure the future of these historic turkey varieties. The domestic turkey is a breed composed of numerous varieties which have a long documented history in the United States and are distinct from their wild cousins. The varieties were standardized beginning in 1874, and DNA evidence shows that all are closely related. Kamara, D., K. B. Gyenai, T. Geng, H. Hammade, and E. J. Smith, 2007. Microsatellite Marker- Based Genetic Analysis of Relatedness Between Commercial and Heritage Turkeys (Meleagris gallopavo). Poultry Science 86:46-49. Powell, R.E. 1990. Turkey Husbandry in Virginia and the Chesapeake Regions 1750-1830. Colonial Williamsburg Research Report 327. Schorger, A. W. 1966. The Wild Turkey: Its History and Domestication. University of Oklahoma Press. Speller, C.F., B. M. Kemp, S. D. Wyatt, C. Monroe, W. D. Lipe, U. M. Arndt, and D. Y. Yang, 2010. Ancient Mitochondrial DNA Analysis Reveals Complexity of Indigenous North American Turkey Domestication. Proceedings of the National Academy of Science 107: 2807-2812. A question we are often asked at The Livestock Conservancy comes from those who don't have the resources to buy a farm, but want to get involved. Fortunately, there are a number of organizations out there who can help. They help aspiring farmers in the upper midwest connect to land, mentors, and jobs, through the Land Link program. There are also beginning farmer resources in almost every state, through non-profit and sometimes state government. Even if you're an experienced farmer, it can be helpful to connect to these organizations and their networks. Try googling "Farm Opportunities <statename>"
Check with your extension agent for other opportunities in your state - there may even be small grants to get you started. If you are new to farming and want to learn more through an internship, google is your friend. Google "Farm Internship" and see how many opportunities show up! It may be worthwhile to connect with your state's farmland preservation trust(s); sometimes families who are struggling to preserve their farms are looking for interns or farm managers to help out. This might also be a way to find farmland for sale. Don't forget The Livestock Conservancy's classifieds! There are sections for Jobs/Internships, and for Stewardship Opportunities. As a member you can post ads for free, so contact the office to set up an account. You can make a difference - Join Now! The Livestock Conservancy is America's leading organization working to protect over 150 heritage livestock breeds from extinction. We are fortunate to have a membership genuinely engaged in our organization and the work it takes to conserve the rare breeds. We hope you enjoy the more personal look at the Conservancy's blog. All images and materials on this blog are COPYRIGHTED. If you'd like to secure permission to use an image or article, please contact info@LivestockConservancy.org. © 2018 The Livestock Conservancy. Simple theme. Powered by Blogger.